Hello Everyone! 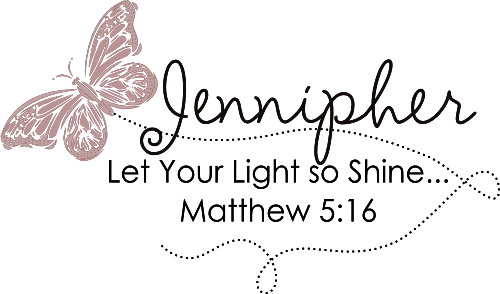 It's Jennipher and I am most delighted to be back designing for Classy Cards N Such. I had such a blast last time I couldn't resist coming back. My card today is 5 1/2 x 5 1/2 square. I started with a base of pale pink cardstock. To the base I added a sheet of designer paper from the Glitz Designs Pretty In Pink Collection. It has such a lovely musical background with just a hint of pink in it. I distressed the edges of my paper and then sponged on Spun Sugar Distress Ink. Before adhering that layer to the pale pink base I added a strip of May Arts Textured Two Tone Ribbon in Fuchsia/Pink across the top. I used my Spellbinders Labels Eighteen largest die to cut out a matching flower border stamp for the Scripture I planned to use. I colored in the tiny flowers with Copic Markers. I just love how they are making coordinating stamps to work with these Spellbinders Dies. It's so much fun! I also used the Spun Sugar Distress Ink around the die cut edges. For finishing touches I found the perfect shade of a pink/fuchsia flower in the Flowershop De Soie Collection by Prima. I added that to the lower right corner of my card. I hope you are inspired by what I created today and will give some of these fabulous products a try! Use my discount code to take 10 percent off your order: JENNIPHER-10. 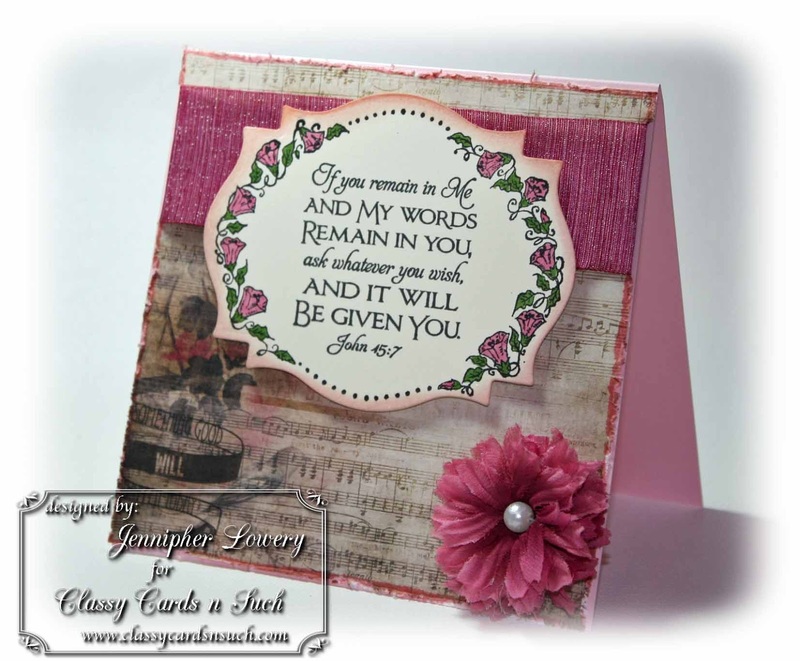 Supplies not mentioned above: Flower Border Die from Our Daily Bread Designs; Scripture Stamp from Our Daily Brad Designs. I would like to enter my card into the Our Daily Bread Shining Light Challenge: Something Musical. This is an absolutely beautiful card, Jennipher! Such a lovely verse and so pretty, framed by blossoms. 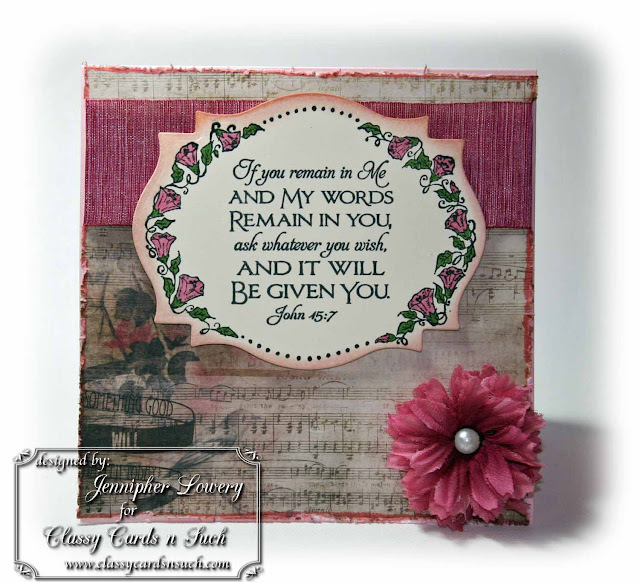 Love the soft pink color and the vintage look of your beautiful card, Jennipher! Your framed scripture verse is gorgeous! Beautiful card Jennipher, love the colour scheme, the paper and lovely verse. This is beautiful Jennipher!! I love all the texture, the frame around the verse, and your colors!!! Gorgeous musical card!! Thanks for joining the ODBD Shining the Light challenge this week!! WOW this is stunning Jennipher! I love the colors and your beautiful verse!! Gorgeous card! I love the papers and colors. What a classy card! Love the tissue tape under the flowers. Just beautiful! absolutely gorgeous card!! thanks so much for playing along with the shining the light challenge this week! This is gorgeous! Love the background paper! Stunning card Jennipher! I love the shades of pink with the music background. I hope you will stop by for a visit. Congrats! Your card really does shine as an example of "classy." I had never heard of their company, so I'm glad you introduced them to me. Gorgeous! Lovely colors and I really like that paper! An absolutely gorgeous card! LOVE the ribbon and the beautiful matching flower! Hope you are doing well! Hugs! !